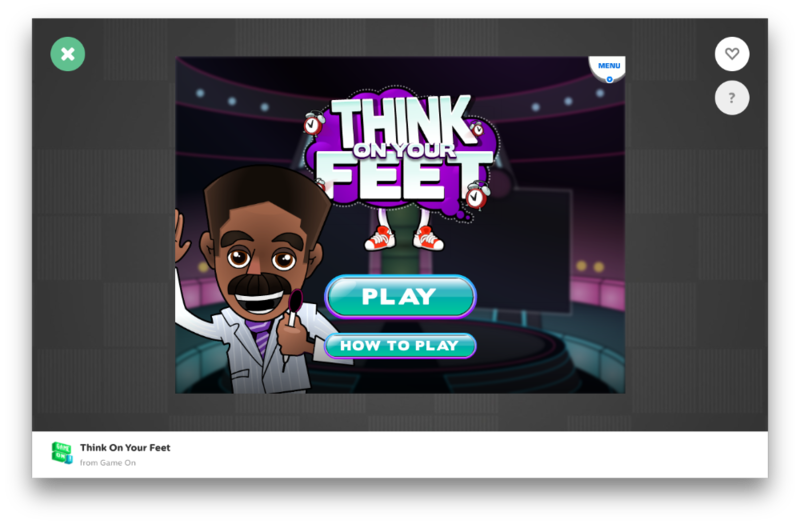 Turn your classroom into a game show with Think On Your Feet! In this GoNoodle Plus game, your students will participate in a fast-paced quiz show incorporating a variety of simple exercises. Think on Your Feet includes hundreds of grade-appropriate trivia questions covering a wide variety of topics, such as Geography, Dates, Music, Books, Art, People, Technology, and more. Think On Your Feet is a team-based trivia or review game that challenges students to quickly answer questions while moving their bodies. Team 1 gets one minute to correctly answer as many questions as they can before Team 2 takes a turn. Each round lasts approximately two minutes, with the physical activity switching at the beginning of every round. Both teams must keep moving the whole time! You can also use your own custom questions to review any subject you like. Note: Think on Your Feet is a GoNoodle Plus game and is only available if you have access to GoNoodle Plus! Learn more about GoNoodle Plus. Explore a variety of topics with grade-appropriate trivia, or use your own questions for a fast and fun pop quiz. Practice listening skills as you follow Rob Rarker’s instructions. While preparing for a test. Think on Your Feet does not work on mobile devices or tablets at this time. This activity can only be played when using a desktop or laptop computer. Make review fun or explore new topics with the wide variety of content available. Choose the question categories you’ll play in this session. Have teams do the prescribed exercise, following Rob Rarker’s instruction. When questions appear on the screen, have students (or a single student) call the answer out loud for their team. Select the correct answer. Teams take turns answering questions, while following along with the exercise by listening closely to the host, viewing the on-screen demonstration, and interpreting the direction with their bodies. Repeat for the duration of the game. You can customize Think On Your Feet with your own custom question sets. For more information on how to create and manage question sets, our Create Question Sets article. Think On Your Feet is a fun way to explore fun trivia content with students on a variety of subjects. Think On Your Feet includes over 1,400 trivia questions for students to answer, split across 8 categories. With the added My Questions capability, the possibilities are endless. The trivia questions are not intended as a “test” of student knowledge; it is not required that students study prior to playing the game. The trivia in Think On Your Feet is intended as a way to to introduce concepts across many subjects and get students’ minds excited and engaged in the world around them. When you open Think On Your Feet, click Play and choose Built-in or Custom question sets. Select the categories of questions you’d like to use in this play session. You can choose one or more categories; the questions in the game are drawn randomly based on the selected categories. When your session begins, Rob Rarker will appear on the screen and ask students to begin an exercise, animated on screen. Teams take turns answering a series of questions, until time runs out. You may choose to read the question aloud, or let students read the question. The class will then answer. Have students continue exercising in place and answer aloud. Before playing, you should set an expectation with your class about how answering will be managed inside your class: you may wish to ask students to answer in unison, or you may elect to select a student to answer. Click the answer your students selected. You will be notified if you answer was correct or incorrect, and the number of correct answers will be tallied at the end of the round. Step 5: Repeat Until the Game Ends. Teams take turn answering their sets of questions, while both teams continue exercising. Think On Your Feet will continue to present new questions and exercises for the duration you selected during setup. Once that duration has passed, the game will end. When the session ends, scores will be tallied and Rob Rarker will announce the winner. If you’re in fullscreen mode, press the ESC key on your keyboard or click the exit fullscreen button under the settings menu in the top right. Then click close to leave the game.